If the above looks interesting, you can have 30 seconds more (maybe a minute if you read slowly and really savor it) of the same by following this link! 1. Intending to enter October Challenge ’15 and failing miserably due to being in maybe one of the darkest periods of my life. Like, didn’t have the electricity or internet to enter, even if I had the motivation. 2. Writing a two-page design brief on how I’d rework the balance and mechanics for my (uncompleted) July ’13 7dRTS earlier this year. 2. Writing a small text-based user survey form in Python for a volunteer organization just this August. However, at the same time, I’ve been working on my career “five-year plan”, if you wanna call it, as well as stitching together the various stories and plot hooks I’ve dreamed up over the years into one overarching story. So, here’s what I accomplished yesterday: Building a particle system for my isometric game. This game has been in the works for a while now, but I’m aiming to get something playable together by the deadline – possibly some kind of ultra-simple twin stick MOBA, or a cooperative defense game (including elements of base construction). Anyways, pretty happy to this system in place. It still needs a lot of tuning, but it looks damn cool. And everyone knows, graphics > gameplay (edit: Images are animated; click to view). Quite a few particles can be on screen at one moment. At least, until I add those perspective performance drains like “enemies” and “objectives”. The sprite creates a perfect particle replica of itself upon death, as you can see when I free their movement. So, I had to work two full shifts this weekend, as well as take care of some other business – meaning, I wasn’t able to participate in LD26. That didn’t stop me from trying, though! I tried to get something together soon enough to enter the jam, but I didn’t quite make that, either. Still, after about 14 hours, I’ve got enough to show off. If there’s any interest, I’ll update when the game is actually finished. Yeah, things got a little messed up there at the end (but it’s fixed now). First of all, I should note that I had some conflict with this, but decided to split my votes 3 Positive, 6 Neutral, and 3 Negative, so I had to work around that. May change it to 4/4/4 for the next round. My preferences were for themes that informed gameplay first and foremost, and offered lots of options, and were not too complex for a 48 hour period. Construction – This is probably what would have gotten my last +1 had I had one. It’s a bit generic, but there are lot of possibilities in almost every genre, storytelling style, art style, etc. End Of The World – Very common, and more of a storytelling theme than a gameplay theme, which is what I think the themes should be about. It’s not bad, though. Ghosts – I frankly just stared blankly at this for a few seconds before downvoting. No ideas at all. Perhaps others will be less dense, but I’m not feeling it. Guardian – This could have some interesting storytelling options in my opinion, and it made me think of Halo which is lovely, but in the end it’s like EotW – too broad and too story-based vs. gameplay-based (there is the gameplay interpretation of attack/defense but that’s too limiting imo). Inverse World – Could be very awesome, but it seems like too much of a challenge to think up and execute a working concept for Ludum Dare, though I might be selling us short. Mirrors – Too specific. It’s been a long time since I’ve seen an original game heavily using mirrors. I don’t want half our games to look the exact same. Outer Space – while I love outer space, and it’s a great setting, it’s not a great gameplay concept. Quarantine – This one I like a lot. You can basically do anything from creating, destroying, or exploring a quarantine, with any character or group of characters, in any control scheme/genre, with no restrictions on story arc or setting (though it might gather a lot of very stereotypical sci-fi/zombie settings, they fit rather easily). 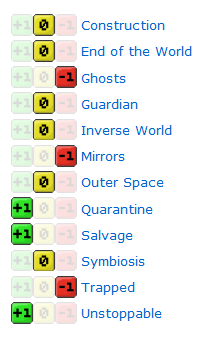 Salvage – Again, very great from a gameplay standpoint imo (though not as good as Quarantine). Trading, collecting, working around, exploring, etc. Symbiosis – it’s… not bad… it’s kind of like a weird mix of a backstory concept, mixed with the difficult-to-execute gameplay ideas of Inverse World. Though I might be underestimating us once again. Trapped – Generic and very similar to the recent theme of Escape. Unstoppable – Something I have a personal predisposition towards, but I like the idea of fighting the inevitable. And you can make basically anything unstoppable – the player, the enemies, the environment, anything affecting the gameplay or story could be the unstoppable thing. Or multiple things could be! Or they could be considered unstoppable, but not actually be such. Lots of meaningful options. My foray into Flixel development is going pretty OK so far, I think! Admittedly, I have been pretty busy this weekend and not very focused when I did have time to code, but I successfully completed a Hello World, EZPlatformer, and a simple shmup. Although I haven’t gotten into all that “win state” and “score counting” nonsense yet. Figured I’d just jump into making a fully-featured FPS with 256 player online or something. The shmup. Sadly it looks like I lost the files for the platformer (and no one cares about hello world screenshots). Not really, obviously. I’m going to try to make a sort of sort-of unique “tower” defense game; basically, you drop stuff on the bad guys from orbit. Simple, but that’s how first games should be right? Not to mention simple games can be pretty popular. I hope to update tonight w/ the basics (control of your attacks, but not enemies, a good UI, or win/loss. etc.)! PS – also, /compo/ has been updating really erratically, and I can’t connect to the IRC either. Anyone else getting that? OK! So, two mini jams coming up! It’s time for the ULTIMATE JAM; learn a new language (Actionscript) and code a game with it in one day (for the SOPA/PIPA jam)! Is this a poor decision? Yes – and I doubt I’ll finish. Perhaps I can mix the S/P jam and the “Fear’ miniLD into one entry? My idea for the S/P jam is to have your character running around sampling works of art (probably musical) and, once you have enough samples, remixing them and uploading them to the internet. However, your efforts are obstructed by the police for violating totalitarian laws. Stuff like that. Run/hide from cops, sample bands, keep your website running despite takedown demands… yes the scope of this is impossible to complete in one day, so the plan is to stick with just this flow of action: Collect music samples for your awesome remix. The more samples you have, the higher your final piece will be. Don’t be seen by police while recording. Get back to your computer and upload the sample (I know this is not accurate to the effects of the bill at all – I just want to make a semi-related game within the time limit). Hey! I’m hoping that this will the motivation I need to get, you know, at least some semblance of a game up and running. A sidescroller where you play as a sort of bounty hunter exterminating an infestation in the bowels of the city. Perpetual boss battles, and hopefully some light RPG + strategy elements. Not the most original, I know, but I’m gonna focus on mechanics for now (+ art design, swanky style, etc).